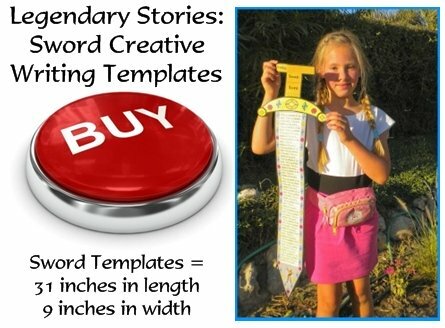 Writing Myths Lesson Plans: Large creative writing sword templates"
This five page banner is included for free in this set of Writing Myths lesson plans. Unique Sword Templates: Are you looking for a creative writing idea that involves your students writing a myth or legend? This creative writing set includes final draft templates for students to write on that are in the shape of a knight's sword. My students have enjoyed the challenge of writing their own myth, but when I combined this activity with these sword writing templates, they became even more engaged and excited about this creative writing assignment. 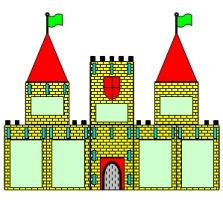 These sword templates are an ideal resource to use along with novels that have a castle, knight, or medieval theme in them. These templates would also work well with a Middle Ages social studies unit of study. 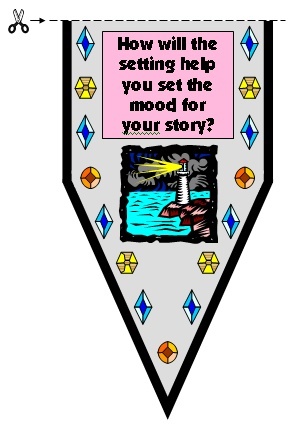 For students who are often reluctant about writing stories, I have found that my students enjoyed this writing topic, especially when they get to complete their final drafts on templates that are shaped like a knight's sword. 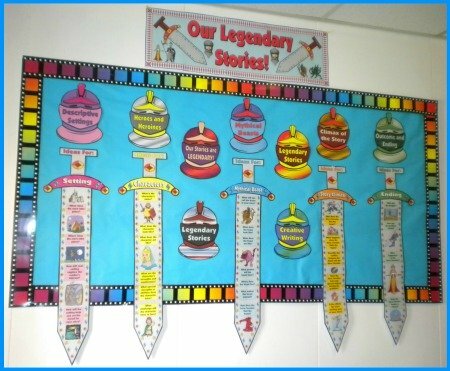 They enjoy coloring and designing their swords and their finished sword projects make a colorful and eye catching classroom bulletin board display. This Writing Myths Lesson Plans is a complete set of teaching resources that will guide your students into writing their own myth or legend. Use this teaching resources set to introduce writing myths to your students. 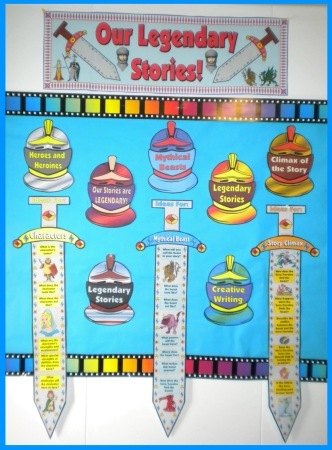 This classroom display set includes 20 pages of printable teaching resources (5 display swords) that will help you introduce writing myths to your students. 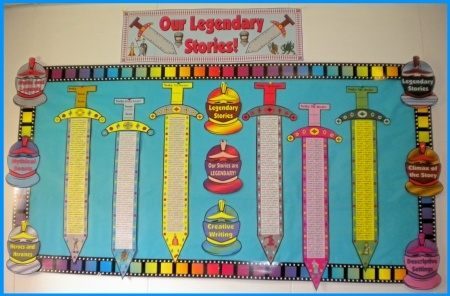 You can display these writing prompt swords at the front of your classroom, or you can create a clasroom bulletin board display using these sword displays. 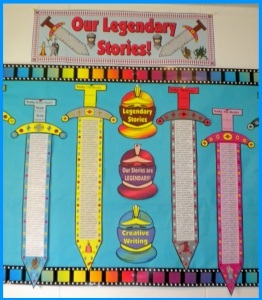 There are 5 sets of display swords for you to use in introducing each aspect of a myth that you want your students to think about as they are writing their own myths. These 5 display swords are the same size and shape as the student templates and each sword measures 31 inches in length and 9 inches in width. 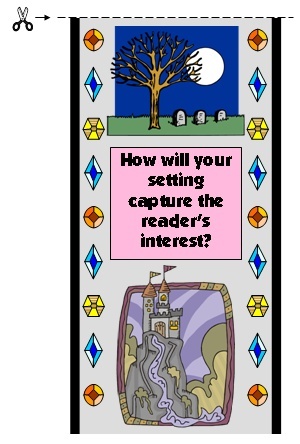 How will your setting capture the reader's interest? How will the setting help you set the mood for your story? Below are smaller examples of the other 4 myth swords that are included in this Writing Myths lesson plans resource set. What does the character act like? What are your character's strengths and weaknesses? What special strengths or abilities does the character have? What challenge will the character have to face? What will you call the beast in your story? What will the beast look like? What will the beast act like? What powers will the beast have? Where does the beast live? What makes this beast unusual? How does the hero/heroine find the beast? What happens when the hero/heroine finds the beast? Describe the conflict between the beast and the hero/heroine. Does the hero/heroine have any special help in solving the problem? Is the climax the most exciting part of your story? What happened to the hero/heroine? Does the hero/heroine receive a reward? 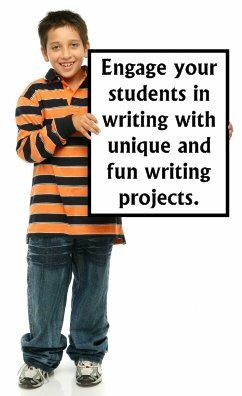 There is a set of directions and ideas for teachers to use in this Writing Myths lesson plans set. 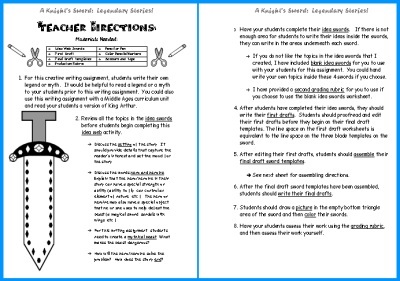 Below is an example of the teacher directions worksheet. There is an assembling directions worksheet for you to give your students on how to assemble these sword templates. There are also directions written on each of the worksheet templates. Below is an example of the assembling directions worksheets. I have found that it is helpful for my students to start their creative writing assignments by beginning with an idea web. My students do not have to write in complete sentences in their idea webs, they are just concerned with mapping out the major elements of their stories. By using an idea web, this also helps my students to break their stories into paragraphs. 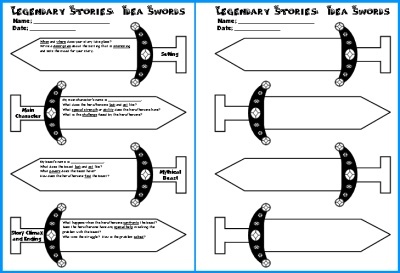 Below are examples of the Idea Swords worksheets that you will find in this Writing Myths lesson plans set. The idea webs are in the shape of swords. 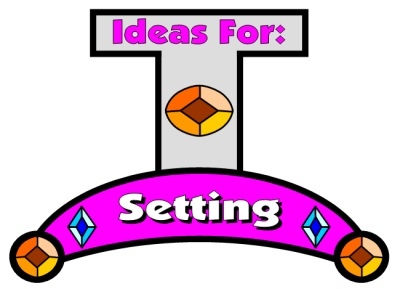 I have provided writing prompts and ideas inside each of the four swords to help guide students in planning their setting, main character, mythical beast, climax, and ending of their stories (left worksheet). These are the same prompts that are in the large display set. If you do not want to use these writing prompts, there is a second version of this worksheet with blank idea swords (right worksheet). For creative writing assignments, I believe that it is important for students to go through the writing process. This process begins with their idea webs and is completed when students publish their work by completing their final draft sword templates. For this reason, my students never begin this creative writing assignment by writing on their final draft sword templates, instead they write on first draft worksheets. Then, they edit and revise their work on their own, with a partner, or in individual writing conferences with me. Below is an example of the first draft writing worksheets that are included in this Writing Myths lesson plans set. The lines on these 2 first draft worksheets match the lines and spaces on the final draft sword templates. 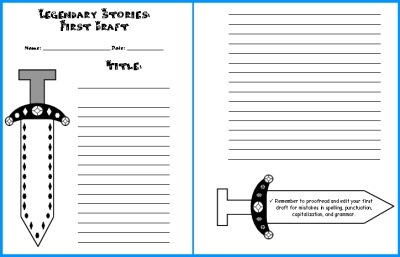 After students have edited and revised their first drafts, you should give them their final draft sword templates. There are 4 templates that are glued together to form a large medieval sword. 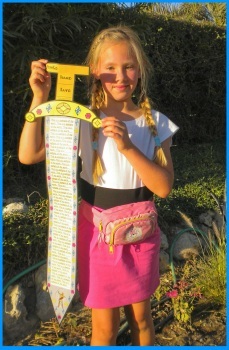 The sword project measures 31 inches in length and 9 inches in width. 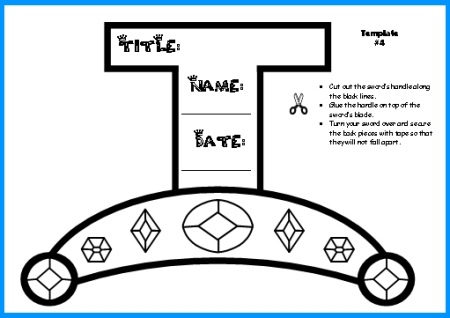 These 4 templates have thick border lines around them, so they are easy for students to cut and assemble their sword projects themselves. 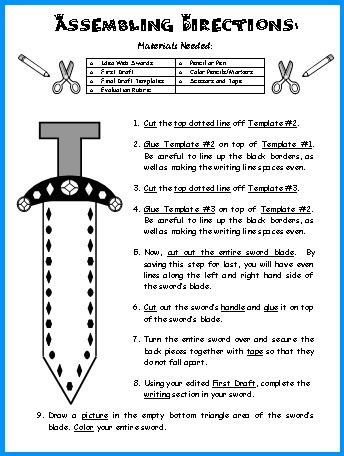 Below is an example of the final draft sword templates that you will find in this Writing Myths lesson plans set. Above: Example of an assembled sword creative writing project. As I am introducing this writing assignment to my students, I like to begin by sharing my myth with my students. I model my idea web and then I read my myth to my students. At the front of the classroom, I display examples of what the final draft sword templates look like. 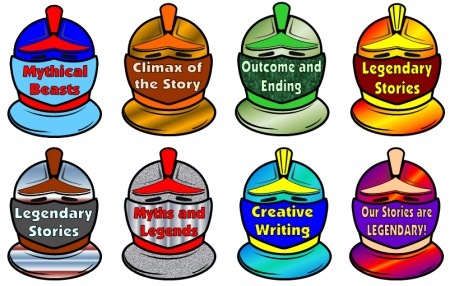 By providing a visual example at the very beginning of this activity, my students know what their myth creative writing assignments will look like when they have completed all of the steps in the writing process. 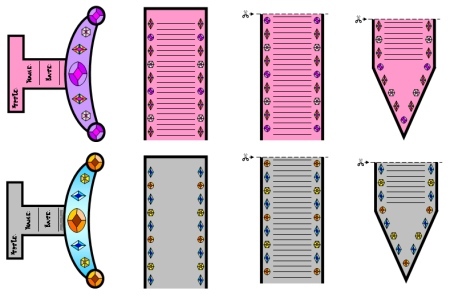 I have included 2 different colored sword templates for you to use as visual examples to show your students so that you don't have to spend time coloring these sword templates yourself. 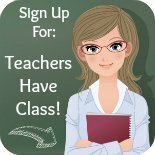 This set of teaching resources includes a grading rubric. I believe that it is important for students to evaluate their own work, so my grading rubric contains both a student assessment and a teacher assessment component. When the students grade their work, they color in the faces. When the teacher assessess the work, the teacher circles the small numbers in each box beside the faces. 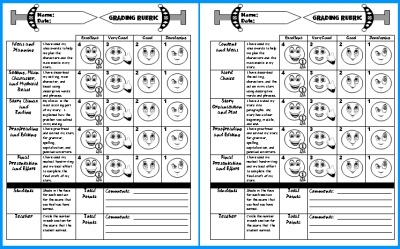 There are two different grading rubrics included in this set to choose from. The first one contains wording similar to the words inside the sword idea webs (left worksheet). The second grading rubric contains wording that is generic and would fit any creative writing assignment (right worksheet). 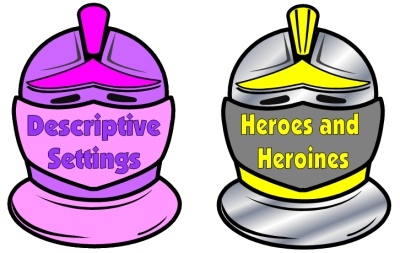 This Writing Myths lesson plans set includes 10 helmet bulletin board accent pieces to help you to decorate your classroom bulletin board display. the bulletin board display banner, and the helmet accent pieces. Are you looking for an engaging, challenging, and extra LARGE book report project with a medieval theme? This resource can be used as a group project, or as an individual student project. 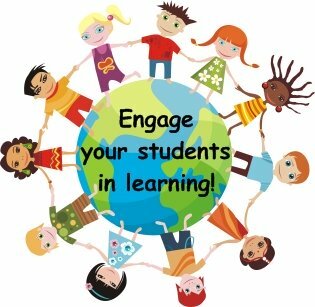 Thank you for visiting my Writing Myths Lesson Plans page.